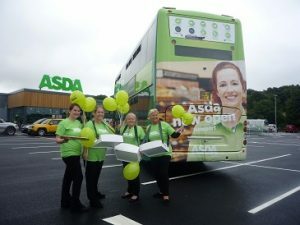 On 21st August the first Asda on the Island opened its doors to shoppers with the new store situated on St. George’s Way, Newport. 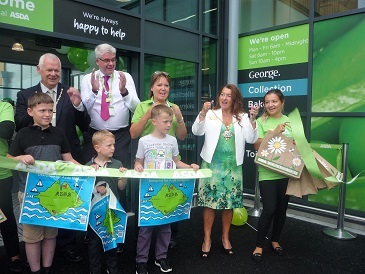 Declaring the store open was Chairman of Isle of Wight Council, Councillor Lora Peacey-Wilcox, alongside the winners of Asda Newport’s Bag for Life competition and store colleagues. Councillor Peacey-Wilcox welcomed shoppers to the store and paid tribute to staff for getting everything ready. Prior to launching, Asda Newport asked local children to submit a design for a bespoke Bag for Life for the store to sell to its shoppers. This design needed to reflect the Island’s key landmarks as well as what the children liked best about their home and the winning painting, chosen from over 300 entries, was completed by brothers Ciaran and Ryan Peterson, aged 11 and 8 respectively. 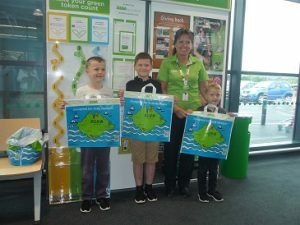 There was also some help from the boys’ younger brother, Oliver 6 and their design featured the Island’s coastline as well as the ASDA logo. They attend Holycross Primary School, East Cowes. As well as receiving £50 to spend in store, the brothers also helped to officiate at the ribbon cutting, which took place in front of an excited crowd of queuing shoppers. Customers started to queue from 7am before the opening at 10am and were treated to entertainment, as well as food sampling whilst they waited. Those at the head of the queue were presented with goody bags as they entered the store. Asda Newport offers a comprehensive mix of food and services with a particular focus on a fresh food department – all with a one price policy, so shoppers pay no more on the Island than they would on the mainland. Amongst the fresh food on offer are many products that have been sourced from local suppliers. There is also a George clothing department and household goods and toys are also available. The car park that surrounds the store comprises of 325 extra wide double lined spaces, with many more speciality spaces for shoppers with disabilities, those with children and electric cars. The four hour time limit for those using the spaces means that Asda shoppers can pop into town alongside their store visit without moving their car. Southern Vectis Bus Services 2,3 and 39 will also serve the store, with a bus stop outside the store entrance as well as on St. George’s Way. Kenny Farrell, general store manager at Asda Newport, said: “Everyone involved with our store is so excited to finally unveil the fantastic things we have to offer to the island. We’ve worked really hard to ensure that every department meets the needs of the Isle of Wight and its shoppers, be they locals or holidaymakers. 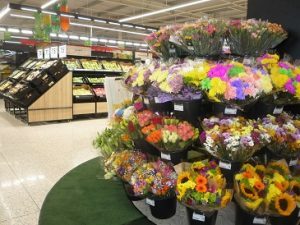 Work on the 45,000 square foot superstore, which has received a £40 million investment from Asda, began in November 2016. 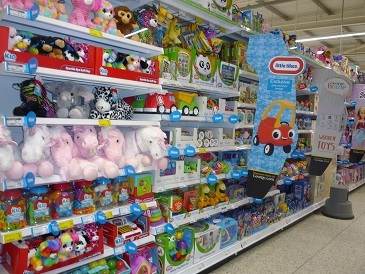 The store has created over 200+ jobs for local people. 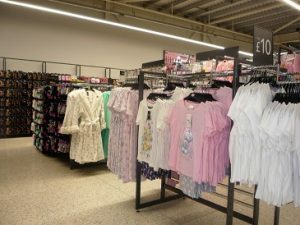 Training for staff was undertaken at other Asda stores in Gosport, Fareham and elsewhere in Hampshire. Asda Newport will open Monday to Friday 6am – midnight, Saturday 6am – 10pm and Sunday 10am – 4pm. A home delivery service will commence soon.